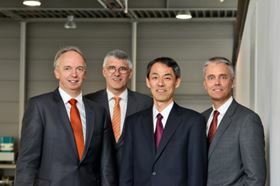 From left to right: Peter Wagner, Dr Martin Fiedler, Hisanao Amino and Stefan Glasmeyer. The Lewa-Nikkiso Industrial division, which includes the Lewa Group, Geveke NV, Nikkiso Cryo Inc and Nikkiso’s Japanese pump business activities, will now be headquartered in Leonberg, the home of Lewa. Naota Shikano, the CEO of Lewa, has resigned from the company’s management team to become a director and vice president of Japanese parent company Nikkiso, with responsibility for the group’s industrial business segments. Peter Wagner will serve as the new CEO of Lewa, while Hisanao Amino has been appointed as chief financial officer. A graduate mechanical engineer, Wagner has worked for Atlas Copco for many years, most recently as president of the Atlas Copco Gas and Process division. He has also served as chairman of the supervisory board of Atlas Copco Germany. Amino spent 30 years working for The Bank of Tokyo-Mitsubishi UFJ Ltd, before joining Nikkiso Co Ltd as general manager of the Medical Division’s Medical Administration Department in 2014. Stefan Glasmeyer continues as chief marketing officer and Dr Martin Fiedler remains chief operating officer, with expanded responsibilities. “This step to form a strong division, reorganise the structure and align our activities where it makes sense will help to serve our customers globally in a better way. It also will generate operational efficiencies within the Industrial division,” said Shikano. Lewa GmbH has commissioned its newly designed process pump testing room in Leonberg, Germany.